USPC would like to wish everyone a Happy Holidays and a Happy New Year. We look forward to 2019 with all the new and exciting opportunities for our members. As a reminder, the USPC national office will be closed December 24- January 1 as we celebrate the holiday season. We look forward to the New Year with our Pony Club family starting January 2, 2019. USPC is hosting Pony Club Members from across the world are coming to the United States in 2019 for the 2019 International Mounted Games Exchange. USPC will host Pony Club members from all over the globe to compete for the glory in Parker Colorado at the 2019 Championships Central. USPC is looking for Team Members, a Team Manager, and a Coach for this exciting opportunity. Click here to apply. Explore the equine world and share your findings with USPC at the Research Project Fair sponsored by the Grayson-Jockey Club Research Foundation. 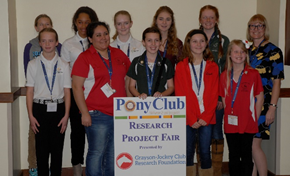 The Research Project Fair will be held during the 2019 Equine Symposium and Convention and is open to Pony Club members of all ages and certification levels. Sound like fun? Apply using the online form. Submit your ideas to the Research Project Fair Coordinator by January 4, 2019. New Horse Management Standards at all levels will be released in 2019 along with revised Dressage, Hunter Seat Equitation and Show Jumping Standards and test sheets. Traditional will have a new name, Eventing, beginning in 2019 as well	with a new look to the Standards of Proficiency and test sheets. The riding portion of the Eventing Standards will be the same as currently until 2020 when these Standards will be finalized. The Western Standards Riding will remain the same but the Horse Management portion will be updated to reflect the new Standards. In summary, all new Standards of Proficiency and Test Sheets will be released for all disciplines in 2019. New for 2019, the Horse Management Handbook is being totally revised with a new look and format to follow the new Discipline Rulebooks. Handbook will be released at the 2019 Equine Symposium and Convention, or sooner online at www.shopponyclub.org.